Over 6 million people across the globe are active participants in the scuba diving lifestyle. In America alone, over 3.25 million people go scuba diving in a single year! Whether you’re just learning to scuba dive or if you’ve been into the scuba life for years, we know you’re excited to learn about the best ways to see what’s going on under the sea. One diving option that people can’t get enough of in recent years? Using an underwater scooter! You’ll be an expert by the end of this post! What Is An Underwater Scooter? Essentially, that’s just a fancy way of saying that they’re motorized scooters that you hang onto with your hands while you ride underneath the water. Instead of relying on flippers and swimming to move you through the water, the scooter pulls you forward. Think of them as mini submarines that you steer with your hands. They usually move at a pace of about 2 knots, AKA, a little over 2 miles per hour. They’re especially helpful for those who are carrying a lot of weight and equipment (like cameras and video recording devices) when they dive. However, even though they’re incredibly strong, the majority of underwater scooters are easy to carry and easy to transport! They can be used for a variety of types of diving. You can go snorkeling, head out on a technical dive, go diving just for fun, or take an open water swim – all with an underwater scooter to help you. These scooters are the most basic option. These aren’t actually powered by a motor – instead, you’re pulled by a rope attached to your diving boat. These are the cheapest type of underwater scooter. It’s almost like going tubing underwater! These are the most popular form DPVs – and if you’re diving for fun, you’re likely to use this model. This uses a small (obviously waterproof) battery-powered motor to propel you forward. This is more of an old-school DPV option, and they aren’t used as often anymore. However, they’re a good fit for those that want to fit two divers on a single underwater scooter. The propeller engine is on the back of the machine, and you can often sit horseback-riding style on it. Sometimes, these models can come with GPS systems, as well as more air for divers. This is a good option for longer dives because it leads to a longer battery life of the DPV. Basically, the DPV has a D-Ring on it to prevent excessive dragging. You really won’t see this option much, though not because it’s outdated or unsafe. It’s because this underwater scooter is military grade! The reality is that, despite what you may have heard, recent studies have shown that scuba diving is just as safe as going swimming. Still, you’ll need to be careful and considerate. This is an important thing to consider when buying an underwater scooter, as it determines how deep underneath the water you’ll be able to go. If you’re snorkeling, you may not need a very big depth, but if you’re looking to really explore, look for something with a depth over 15 meters. If you’re just learning to scuba or if you’d rather do a quick dive, then you can get away with a battery life of at least 30 minutes. However, if you like to stay out for longer, look for options that have a lithium battery. These batteries last longer, especially if you’re going to be frequently adjusting your speed underwater. There are even options that allow you to stay underwater for about 150 minutes! If you’re doing multiple dives in one day, be sure to give your underwater scooter enough time to fully recharge before you hit the water again. Remember that your scooter alone doesn’t impact your buoyancy – it’s also affected by your weight and the equipment you’re bringing with you. The greater the buoyancy, the more effort and power required. Luckily, the majority of models allow you to adjust buoyancy levels through controls. Of course, you still need to make sure you’re using caution (and above all, common sense) when you’re diving. First of all, if you’re going diving with a professional company, always make sure you follow any instructions and familiarize yourself with the calls and signals for help. Since you can control the speed of your scooter yourself, it’s a lot easier to stay safe. Always make sure there is another diver in view! Finally, if possible, try to avoid lurking near the floor. The engine, especially the propellers, can cause you to “kick up” sand. This won’t only make any fish or animals living there angry, it can also make it hard for other divers to see. Why You Have To Try Diving With An Underwater Scooter! There are a million different reasons why you should try a DPV, no matter where you’re going diving or the length of your adventure. Whether you’re not in as good of shape as you once were, or if old age has slowed you down, you don’t have to turn down the chance to scuba! 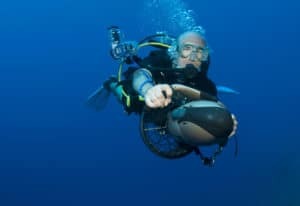 An underwater scooter is incredibly comfortable, and it won’t leave you exhausted from the physical work of regular diving. Plus, it’s also much easier to navigate. This means you can see things and places you normally might not be able to physically get to! An underwater scooter makes diving possible for the whole family, regardless of age or skill level. Also, if you run into trouble, get out too deep, or have problems, you can get help much faster. It’s also easier for divers to pull one another to safety in the event of an emergency. A disability shouldn’t prevent you from exploring the beauty and excitement of our oceans and seas. An underwater scooter makes diving safe and possible for everyone. Of course, because the scooters move faster and are less tough on you physically, you’ll be able to get the most out of what might be a once-in-a-lifetime dive! End your scuba trip with no regrets, knowing you saw as much as you possibly could. When you’re snorkeling, you might notice something super cool a bit further under the water. But unless you have something to help you stay down, it can be tough to get to! Underwater scooters allow you to resist the natural urge to float back to the surface. Plus, you won’t have to hold your breath for too long! Ready To Book Your Underwater Scooter Adventure? This summer instead of taking that boring family trip that you’ve taken for the past five years, why not do something truly different – something that the whole family can enjoy? Now that you know that underwater scooters are safe, fun, and allow you to see more of underwater life than other traditional diving options, what are you waiting for? Make this your best vacation ever. To add even more excitement, why not look into other activities like spearfishing? Looking for more information on how to get the most out of your time under the sea? Whether you’re into spearfishing, scuba diving, or snorkeling, we’re the ultimate authority on all three of these popular water activities. Check out our blog for up-to-the-minute and experience-informed advice on the latest trends, equipment, and destinations. Don’t spend another vacation indoors, watching Netflix and worrying about getting back to work. Instead, seize life and discover the whole world that’s underneath the water’s surface.